What is Intercooler ? How Does an Intercooler Works ? On a turbo diesel engine, the intercooler's presence is always included. The reason, because turbocharger and intercooler is a package of air duct system on diesel engine. We already discussed the function of turbocharger, then what is the function of the intercooler and how does it work? the name of Intercooler, it consists of two words "inter" which also means "internal" and "cooler" which means a cooling device. 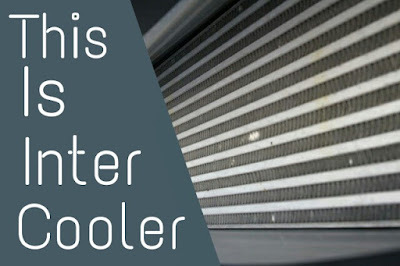 Intercooler is a device used to cool air internally. This can be interpreted, that the intake air that will be inserted into the combustion chamber will be flow through an intercooler so the air can reach lower temperature. Why does intake air need to be lowered? Base on ideal gas law, that the higher air temperature the bigger air molecule / expands. If the air molecule is large, then there are only a few air molecules that can be accommodated in the combustion chamber. So the engine power is reduced. Pre-ignition is the combustion that occurs before the timming, or it can be said early burn. It is happended because the air temperature inside the combustion chamber is very high before the timming reached. On gasoline engines, this will lead to pre-ignition that sounds like knocking. With the intercooler, the air that will enter the combustion chamber has a lower temperature. When the air temperature is low, it make the air molecules smaller so that the air will be more dense (with more mass) in the combustion chamber. This will make greater combustion power. Intercooler works with the thermodynamics principle, more precisely inside the intercooler will occur convection and conduction. It’s heat transfer due to movement of fluid (gas). Like the picture above, the intercooler design consists of several pipes. Among the pipe is placed an air fins. This air fins have a function to absorb a heat from the air inside the pipes, at this time heat conduction occurs. The air exhaled from the turbocharger, will go into the intercooler pipes. The heat, will be absorbed by intercooler pipes and intercooler fins. On the other hand, there is a gust of outside air that passes through the intercooler fins. At this time, heat convection occurs, the heat contained in the intercooler fins will be transferred into the air passing through it. So the air temperature inside the intercooler pipes is cooler. Who breathed the outside air through the intercooler? This is the cooling fan job, intercooler mounted in front of the radiator. Thus, when the cooling fan rotates, not only the radiator but the intercooler will be cooled too. Intercooler without turbocharger, can it perform ? Because of this benefits, many vehicle owners want to modify the engine by adding an intercooler device to their vehicle. But, if you install with the turbo, it must be complicated. Then can we add an intercooler without turbo? Obviously it will be difficult, the intercooler design consist of small pipes. It will make the air blown. As a result, the engine will be restrained due to blown intake air flow and can not reach the top RPM. However, with the turbo, the air can be lighter because the air has been getting a boost. Air to air intercooler is the type described above. To cool the intake air, it use outside air that exhaled by cooling fan. As the name implies, the intercooler uses engine coolant to lower the intake air inside the intercooler. How it works ? cold water will be pumped through the intercooler fins. After that, the water will be sent to the radiator for cooling, after the water temperature returns, the water is pumped back to the intercooler. That's all I can share, hopefully can add to our insight. If you have any questions please leave a comment below.